Saratoga superstar Alicia Follmar romps to a win in the girls varsity division at the league finals. It was a day that belonged to Monta Vista. Oh, so maybe Los Gatos and Saratoga shared a piece of it—but for the most part, the Santa Clara Valley Athletic League De Anza Division cross country finals were dominated by the Matadors. Monta Vista won individual and team titles in all three boys' events at the league meet, and the Matadors won a girls' championship as well as they raced to a great showing on the 2.95-mile course at Crystal Springs in Belmont. Monta Vista freshman Scott Russell and Saratoga sophomore Alicia Follmar were the individual stars of the day. Russell topped the field overall, running 16:40.6 to win the boys varsity crown. Follmar ran 19:15.1 to claim the girls varsity title. For Follmar, the win was nothing new. She has been dominating the area cross country scene all season long, despite being just a sophomore. Follmar was alone at the finish line in the league meet, winding up more than 23 seconds ahead of her nearest rival. Senior Erica Williams of Los Gatos was second in 19:38.8, with Lynbrook junior Aya Wakabayashi third in 19:50.0. Rounding out the girls top 10 were senior Carolyn Penner of Los Gatos, fourth in 19:58.7; junior Dana Underwood of Monta Vista, fifth in 19:59.9; junior Shana Ravel of Los Gatos, sixth in 20:24.5; freshman Ali Rubnitz of Los Gatos, seventh in 20:29.5; freshman Zohreh Akhavan of Lynbrook, eighth in 20:33.6; junior Jill Blake-Burke of Monta Vista, ninth in 20:39.7; and senior Christine Yow of Monta Vista, 10th in 20:43.4. Los Gatos ran up a low 31 points to win the team championship in the varsity girls division. Lynbrook finished second at 53, with Monta Vista third at 64 and Saratoga fourth at 107. Christina Liao, Sasoon Kim, Agnieszka Goslicka, Kate Bossange and Francine Lee supported the performances of Wakabayashi and Akhavan to lead Lynbrook to second in the team standings. Liao, a freshman, was 13th in 20:54.8, with juniors Kim (14th in 21:14.4) and Goslicka (15th in 21:15.0) close behind. Bossange, a senior, was 17th in 21:28.2, and Lee, a senior, was 20th in 21:37.2. Saratoga's Rachael Foust (junior, 21st in 21:38.7) and Annie Tam (sophomore, 23rd in 21:48.3) supported Follmar's effort. Except for a girls junior varsity win by Los Gatos freshman Stephanie Wilcox, the rest of the day belonged to Monta Vista. Russell was something of a surprise winner for the Matadors in the varsity boys race. The freshman blistered the course in 16:40.6 to finish almost six seconds ahead of the field. Running second was his Monta Vista teammate Ian LaForm, also a freshman. LaForm was second in 16:46.2. Fremont senior Mike Pullano ran a strong race to grab third in 16:51.2, and Monta Vista sophomore Jason Yow was fourth in 17:04.6. Saratoga junior Steven Surrette was fifth in 17:06.3, with Fremont junior Austin Sardella sixth in 17:08.4, Cupertino senior Brian McDonough seventh in 17:11.1, Homestead freshman David Pochowski eighth in 17:16.7, Monta Vista senior Drew Fetterman ninth in 17:20.2 and Saratoga junior Will Alleshouse 10th in 17:22.2 to finish off the top 10 overall. Senior Julian Kolev was 15th in 17:35.8 to round out the first five finishers for Monta Vista and help the Matadors run up 31 points to claim the team title. Fremont was second at 56, and Saratoga was third at 81. Rounding out the first five finishers for the third-place Falcons were sophomore Hari Subramaniam, 14th in 17:34.7; senior Jacob Osborne, 21st in 18:01.8; and freshman Robert Paolini, 31st in 18:32.9. Lynbrook's Eugene Berson and Luis Jensen also ended up in the top 20. Berson, a junior, was 16th in 17:44.8 and Jensen, a sophomore, was 17th in 17:48.0. 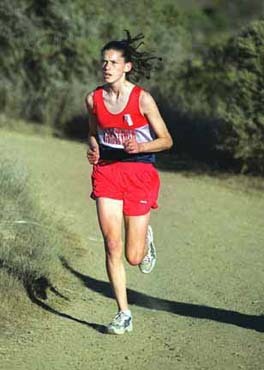 Sophomore Matt Paquet ran 18:20.8 to finish first and lead the Monta Vista boys to a title in the frosh-soph division. Matt Lee was third for the Matadors, with Nayson Fernandes fourth, Alex Chen seventh and Craig Kawashima 11th. Saratoga freshman Henry Barmeier was fifth in the race in 18:36.6. Aaron Teagle was 12th overall to lead Lynbrook to a team third. Jon DeSimone was 14th, Kevin Sun 15th and Eric Sasaki 16th for the Vikings. Justin Lee was the individual winner in the boys junior varsity race, leading Monta Vista to a team championship. Seth Kugler was second, Elliot Jones third and Justin Bahng seventh for the Matadors. Joseph Seo of Fremont was fourth, with Jeyvel Pandian of Lynbrook fifth, John Muhr of Saratoga sixth, Andrew Hao of Lynbrook eighth, Kenji Cox-Muranami ninth and Chris Chapman of Saratoga 10th. In the girls JV race, Los Gatos' Wilcox was first and Anjali Kumar of Saratoga was second, but Monta Vista took the team title. Lynbrook's Soo Lee (fourth), Hyan Kim (sixth) and Amber Ju (10th) were also in the top 10. Prospect didn't figure among the leaders when they were adding up the team scores in the girls varsity division at the Blossom Valley Athletic League cross country finals last week. But that doesn't mean it was a bad day for the Panthers—Rebecca Palm saw to that. The Prospect sophomore covered the 2.95-mile course at Crystal Springs in Belmont to finish fifth in the league meet. But the Panthers have just four runners in the girls varsity division and need five to figure in the team scoring. Still, it was quite a day for Palm. She finished 16 seconds off the winning pace set by Silver Creek senior Cherie McPherson, and she was only nine seconds behind fourth-place Veronica Vasquez of Overfelt. Palm's Prospect teammate, senior Edina Hamulic, was 56th overall in the 119-runner field. Freshman Kiren Chand and Pramod Madhurima were other Prospect finishers. Westmont ended up 12th in the team standings at the league meet, led by junior Kristine Amit, 26th in 21:42.0. Senior Jenny Jackson was 33rd for the Warriors in 22:00.0. Junior Liz Medilcott, senior Edna Monrou and senior Robin Shpiel were other Westmont finishers. In the boys varsity division, Westmont ran to a team 11th behind the finish of Michael Pickens. The freshman ran 17:41 for a 30th-place finish in the 137-runner field. Andrew Tupper (56th), Yuta Nakata, Willie Chang and Stephen Warren rounded out the top five for Westmont. Senior Nicholas Song led the Prospect showing in the boys race. Song was 28th in 17:36 to lead the Panthers to a team 16th. Senior Scott Smith was 37th in 17:48 for Prospect, with Alex Lin, Austin Day and Taka Yokoymama finishing off the first five. In the boys frosh-soph division, Stephen Derendinger was 28th in 20:13 and Alex Duong was 32nd in 20:31 to lead the Prospect showing.